In one instance, I was fortunate enough to meet the director of risk management for a local county here in South Florida. The county is represented by one of our VUE Wrap-Up clients, and they recently switched to our client’s firm from another very large insurance broker that offers administrative services. In our discussions, it was obvious that their former provider’s technology was a major pain point for them. This was noteworthy since the former firm continues to invest significant resources into developing and improving their in-house wrap-up technology. Some brokers and administrators tout their in-house technology as a differentiator. However, as in the county’s case, even name-brand national firms’ technologies can receive sub-par reviews from sponsors. It got me thinking about what matters most to an owner about the administrator’s technology. When I asked the county risk manager, the answer was simple: information. The owner does not care what programming language was used to develop the software. They don’t care about what type of protocols are used for integrations, or how the software is hosted. They don’t really even care if the software is pretty to look at. The only thing the owner really cares about when it comes to the software itself, besides the security of their data, is how easily and quickly they can get information on their projects. It doesn’t have to be flashy, it just has to be complete, accurate, and up to date. The county’s former service provider’s system made it very difficult for them to locate and run reports for their projects. Often, they would request a report from their administrator, rather than log in and run the report themselves. Then, it would take a few days to receive the report. 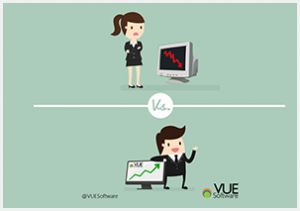 So they were thrilled when they saw how easy it would be to run a report themselves in VUE, and to know that they could receive reports automatically to their inbox every week. It’s the little things that make a big difference when securing a relationship with a long term business partner. And an administrator’s software program is one such item that can directly impact their CIP sponsor’s satisfaction. Admin firms should be advised not to risk this important aspect of their service on outdated notions. If outsourcing, don’t settle with a vendor that is not meeting professional standards for the industry (look for CMMI ratings, SSAE 16 certifications, size, references and track record). And if you do invest in an in-house platform, consider the possibility that this practice could be diluting your resources, diverting organizational focus and driving up your fees. If your sponsors are unsatisfied, there are many competing firms that are well-positioned to lure them away.